I wrote this article in order to give you everything you need about choosing the perfect uncommon and cute baby girl names, so Let’s get started. One of the most integral part of our identity as humans is our individual names. Nearly every mortal that has ever been born has been tagged with a name. Our names are the foundation upon which the pillars of our identity are built on. Names bear meanings that are as diverse as our faces. Different cultures also attach varying degrees of significance to names. For example in Asia and Africa, a high degree of significance is attached to names. People from these regions believe that names have a role in the way the trajectory of a person’s life turns out. Others seem to believe that names unite people, such as the case with surnames in China. In China, people with the same surnames develop a level of intimacy as soon as they find that they are namesakes even though they are just meeting for the very first time. However, this degree of significance is less prevalent in the western world. In the west, most names have their roots in either family tradition or biblical history. Christians in the west have a practice of naming their kids with names bore by people that lived in bible times with the hope that their kids will adopt the traits that made the biblical heroes famous. Names that have roots in family history might be traced to the occupation of progenitors. Whatever the reasons are, another factor that plays a heavy role in the choosing of a child’s name is cuteness. Parents, especially those in the west like their kids bearing cute names that makes them appealing to the public. If you are thinking of ideas on what might be the most suitable names for baby girl, then the following tips would help you reach a decision. Think About Your Favorite Characters: Most people in western society are named after a famous character. A great percentage of these persons named after a famous character bear names that have roots in characters portrayed in religious books. If you hold strong religious beliefs, then a good idea for naming your kid would be a religious character whose life you greatly admire. People name their children in this manner hoping that their kids will turn out just the same the life of the famous character they are named after was portrayed in the religious books. However, if you are not a religious person, you can draw name ideas from your favorite rock, movie or sports stars or a famous philosopher, scientist or politician whose life you admire and in whose steps you hope your child will walk in. Draw Ideas From Nature: A great number if people are named after certain elements of nature. Nature provides us with an inexhaustible resource to draw from. Fortunately, one of such resource is the inspiration of cute names for our girl. Ideas you can find in nature include tranquility (Peace), beauty (Rosemary), and refreshing scent (Fragrance). The possibilities are limitless. To draw ideas, look at the plants or that beautiful island resort. Whatever you do, ensure you come up with a cute name that is not only appealing but holds a meaning that the child can hold on to throughout their life. Consider Family Names: Are you driven by the need to sustain your family’s legacy?,Or perhaps you want to honor a loved one that died in their early years?, Or maybe you want to immortalize your mother, sister, or aunt? Or maybe you want to continue a family tradition of sustaining a particular name that has been held for the last three generations. For example, say your great-grand mother bore the name Hannah, your grand mother bore Anna, and your mother is Ann.If this is a name you like, you can add it as one of the names for your girl child. Make a Game Out of Your Search: Make a game of asking people their names, the meanings as well as the circumstances of their birth that warranted such names. Walk around with a journal too or simply take notes in your iPhone. Talk to as much persons as you can and gather as much names as you can, then scrutinize the list to find the ones that are most suitable for you. Match With Siblings: Another way of getting name ideas for your baby girl is to try matching concepts with that of her older siblings (if she is not a first born). For example, if her two older siblings bear Marcus and Martha, you could name her Mary, Mindy or Mirabel. No matter the name you come up with ensure that you don’t get so caught up in the fun of looking for cute names that you ignore the importance of meanings. If you are having a hard time coming up with ideas to match the names of her older siblings, then you can look up online. There is a vast array of websites that carry a catalogue of names that you can give to a girl child. Match With Your Last Name: Also, in naming your girl child, you might want a name that matches your last name so ensure that as you are on the look out for cute names, you should also consider the fact that it is also important that it rhymes with your last name. 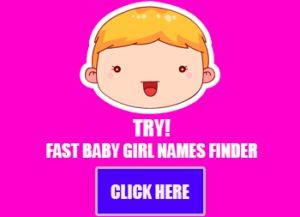 Our search engine has Over than 16000 popular, Unique, unusual and cute baby girl names with meanings and international origin information.